VA’s Mobile Discussion Series is a monthly webinar featuring a variety of topics focused around app development and mobile health at VA.
VA is using technology to provide care when and where it’s needed and December featured a timely discussion on how VA technologies including CPT Coach, Mindfulness, Virtual Hope Box and Annie are being used to ensure there is no delay in care for mental health, even during holiday travel. Minding our Veterans: Using Technology to augment psychotherapy and self-care provided a topic-based discussion just in time for the holidays. As part of National Caregivers Month, VA recognized family caregivers for the tireless effort they provide in caring for Veterans. The November Mobile Discussion Series – Care for the Caregiver – featured how VA technologies are being piloted by clinical teams to improve caregiver’s access to resources and support. The MyVA Health Journal app allows Veterans to update and enter personal information about their health. With the app, Veterans can store contact information and health and military histories, as well as record wellness goals, take health assessments, monitor mood, add appointment plans and create entries about a variety of health topics. The Summary of Care App allows Veterans to view specific parts of their VA Electronic Health Record (EHR) on a mobile device. With the app, Veteran patients can view VA EHR data, including patient contact information, medical diagnoses, allergies, medications, lab results, and vital signs. Annie is a Short Message Service (SMS) text messaging capability that promotes self-care for Veterans enrolled in VA health care. Annie sends automatic messages and reminders to Veterans to track and monitor their health based on protocols established by their care team. Veterans respond back to these texts with health readings and other information. It can also send medication reminders, as well as educational and motivational messages to help patients manage their care and stay on track. Users of the mobile app version of Annie can also view their data graphically to better understand their progress toward health goals. The Exposure Ed App gives VA and non-VA health care providers information on military-related exposures. During their service, Veterans may have been exposed to a range of chemical, physical and environmental hazards, and providers can use this app to have an informed discussion with Veterans about their individual exposure-related concerns and potential impacts on their health. Providers can also access information on exposure-related programs and benefits offered by VA and help Veterans assess their participation eligibility. The Patient Viewer App gives VA staff secure access to Veteran patient records from the convenience of a mobile device. Whether walking the halls of a medical facility or during time away from it, VA care teams will be able to respond more quickly to patient needs that arise between appointments. The app allows care teams to access information, including real-time vitals, notes, labs, imaging results, and both inpatient and outpatient medications and allergies. The VA FitHeart and CR Pro apps work together to simplify care management of Veterans participating in cardiac rehabilitation or living with a heart condition. VA FitHeart encourages Veterans to increase physical fitness and provides tracking tools to help them monitor their heart health and progress towards their goals. VA care teams then use CR Pro to view the fitness and health data recorded by their patients in VA FitHeart and, if desired, export it as a progress note into the Computerized Patient Record System (CPRS). The VA TeleDerm App allows VA care teams to capture and store digital images and associated clinical data to provide safe, appropriate and cost-effective teledermatology services to Veterans. The app is designed to integrate with current VA consultative store-and-forward teledermatology practices by packaging the necessary tasks for referring clinicians and imagers into one app. VA TeleDerm ensures all members of the health care team have access to up-to-date and accurate records. This discussion covers VA’s suite of health care apps and how they help Veterans, service members and their families learn how to manage their mental health. VA offers tools and information to help app users manage a wide range of mental health care issues, including apps to manage PTSD-related symptoms and stress, practice mindfulness, strengthen parenting skills, cope with anger and learn problem solving skills to overcome obstacles. VA mental health care apps can be used on their own or can be combined with treatment from a Veteran’s care team. Learn more about MOVE! Coach, an app for Veterans, service members, their families and others who would like to lose weight. Over a 19-week program, app users can monitor, track and receive feedback regarding their progress with weight, diet and exercise goals. MOVE! Coach also provides educational resources for overcoming barriers to weight loss, and the app can be combined with treatment from a Veteran’s care team. This app is currently available in the iOS App store and will soon be available for Android devices. VA provides a variety of apps for Veterans and VA care teams to increase access, communication and coordination of care for Veterans. Mobile health apps can help Veterans become more active participants in their health care, while apps for VA care teams improve the work flows of care teams, leading to improved quality of care. This webinar provides an overview of the process for rolling out a mobile app, what to expect during implementation, how the apps may integrate into existing workflows or systems and how these new technologies can enhance Veteran care. Learn more about VA DoD Veteran Link, a new social networking app that provides Veterans receiving VA health care and current service members a way to find support within their peer group. App users can find information about health-related issues, search for other Veterans and service members based on information they have shared, and join groups to discuss specific topics with others. Because the app is limited to just Veterans and current service members, VA DoD Veteran Link gives users a safe space to open up about difficult topics and build an empathetic and supportive community. Learn more about VA Online Scheduling, which allows VA patients to schedule and request certain appointments online. Through My HealtheVet, Veterans at participating facilities can now schedule and manage their care and certain specialty appointments, view their VA health record, use Secure Messaging and more. With the option of using either a My HealtheVet Premium Account or their DS Logon Premium account, Veterans can access VA Online Scheduling in a way that is most convenient for them. This webinar reviews the evolution of the online scheduling tool and explains how to access and use online scheduling through My HealtheVet. Learn more about the Genetic Diagnostic Testing (GDx) system, which puts genetic testing data into the hands of patients. Through the GDx App for Veterans, Veterans can view and share their VA-ordered genetic testing results with their VA and non-VA care teams, and with GDx for VA Care Teams, health care providers have access to their patient’s genetic and genomic test results making it easier to develop personalized treatment plans. This webinar reviews the functionality of both GDx Apps and shows how they will transform health care for Veterans who have genetic testing by streamlining and increasing access to care. Learn more about the new Immunization Campaign App, which will streamline the process of influenza vaccine administration to save time for both VA care teams and the Veterans they serve. This session will demonstrate how this innovative new app offers a single log-on to conveniently document immunizations for multiple patients. Learn more about Rx Refill, an app that gives Veterans an additional online option to request and track prescription refills from their mobile device for more on-the-go flexibility. Veterans using Rx Refill can request refills for eligible active medications, keep track of medications, monitor the status of refill requests and track medication refills through the VA Mail Order Pharmacy – anywhere, at any time. This session demonstrates how to use the app and how easy it is for Veterans to find their accurate and up-to-date prescription information. With the Mobile Blue Button and Summary of Care Apps, Veterans have an easy way to access and manage their Electronic Health Record (EHR). This webinar explains how Veterans will be able to use these apps to access, graph and even print data such as lab results, surgeries and medications from anywhere with their mobile device. The June Discussion Series covers VA Video Connect, a mobile and web-based application that connects Veterans with their VA care teams using encrypted video. Through the app, Veterans can see and talk to their health care team from anywhere, making appointments more convenient and reducing travel and wait times. Learn more about connecting with Veterans, and how the VA Video Connect App helps provide more information for health care teams and those working with Veterans. Learn more about Patient Viewer, an app that makes it easier for VA care teams to find information quickly from patients’ Electronic Health Records (EHRs) from the convenience of a mobile device. The app helps care teams gain immediate access to EHR data— including labs, notes, medications and more— both in a VA facility and on the go. This session covers how clinicians view Veteran medical profiles, write free text notes on the go and more. Learn more about Annie, a Short Message Service (SMS) text messaging system that promotes self-care for Veterans enrolled in VA health care. Veterans using Annie receive automated prompts set up by their clinicians to track, monitor and report how they are doing. The webinar covers how VA care teams can set up prompts with Annie, send educational messages and distribute system messages for their VA medical center location. The Mobile Kidney App is currently being developed to help patients and their VA care team monitor several indicators of kidney health. This session covers features of the app, which can keep track of Veteran patient data like weight, blood pressure, pulse and glucose levels. Veteran users will have the ability to set reminders to log in, enter information, share updates and receive messages from their VA care team. VA is developing several apps to help Veterans access their own personal health information and stay in touch with their VA care teams. These apps connect to the Electronic Health Record (EHR) and require the user to have a secure logon. This logon, called DS Logon Level 2 (Premium), enables Veterans to log in securely to VA and DoD websites and apps using a single username and password. This session covers how DS Logon differs from other logons, includes information about how a Veteran can register for an account and goes over where to find DS Logon resources. The Remote Veterans Apnea Management Platform (REVAMP) enables Veterans with Obstructive Sleep Apnea (OSA) to be evaluated and treated without needing to travel to a VA sleep center. Veterans diagnosed with OSA who use REVAMP receive equipment for treatment, which records sleep and breathing statistics. Data are transmitted wirelessly so both Veterans and practitioners can monitor treatment effectiveness. This session provides an overview of REVAMP, how it works and plans for the future. The Hearing Aid Distance Fitting Application (HADFA) allows care providers to remotely make adjustments to a Veteran’s hearing aids, while simultaneously holding a video conference with the Veteran using VA Video Connect. Connected Care (10P8), Rehabilitation & Prosthetic Services (10P4R) and VHA Innovation (10P8) collaborated with industry hearing aid manufacturers to create HADFA for Veterans and care providers to use through iOS and Android operating systems. This session provides an overview of the app and offers information about what’s in store for the future. Interested in learning more about the Veteran Appointment Request App (VAR)? VAR is a new, mobile approach to scheduling VA appointments that makes it easier for Veterans to request primary care and mental health appointments at VA facilities where they receive care, view appointment details, and even schedule certain primary care appointments directly through a calendar in the app. This session provides an overview of the app, feedback and results from field testing, and what’s in store for the future. The VA Pressure Ulcer/Injury Resource (VA PUR) App is a new app designed to help Veterans and their Caregivers learn about preventing pressure ulcers/injuries, and to provide Veterans and Caregivers with tools to manage their health. The app allows users to create journal entries to track pressure ulcers/injuries, set reminders to move, eat and take medications, learn more about improving daily care practices, locate nearby VA medical facilities, and more. This session provides an overview of the app, feedback from the first users at the Philadelphia VAMC, and next steps for deployment. Learn more about the latest updates on the VA App Store, tips and tricks for navigating the site, and what’s in store for the future. This session will provide an overview of what you can find on the VA App Store, including training materials, videos, and more. You’ll also get a sneak peek at the new VA Beta App Store, which allows users to sign up to be the first to test new apps prior to national launch, as well as the new Office of Connected Care website, which serves as a one-stop portal to access information about VA digital health technologies. Learn more about ClinicalKey, an app and clinical search engine that helps VA care teams find resources that provide clinical guidance and help them make better decisions anywhere, anytime, in any patient scenario. By providing access to a common source of trusted clinical content and evidence, ClinicalKey is designed to help reduce unnecessary tests, treatments and errors, and integrate with VA’s electronic health record (EHR) to become a natural extension of the workflow for VA care teams. This session provides an overview of both ClinicalKey and ClinicalKey for Nursing, a resource specifically for nurses. Learn more about VisualDx, an app that gives VA health care professionals access to a massive image library to help aid diagnosis right from their mobile device. VisualDx lets health care professionals look up more than 40,000 of the best medical images in the world to compare visual presentations of disease, dermatologic, ophthalmologic, and mucosal — all of which capture the variation of disease presentation by age, skin type, body location, severity and more. This session provides an overview of the app, and how it can be used to help VA health care teams. Learn more about Nursing Shift Companion, an app that helps VA nurses to streamline their workflow and track patient data during their nursing shifts. Using the app, VA nurses can add a patient to the clinician’s tracking list, create single-instances and recurrent custom tasks, mark tasks complete, create a Nurse Shift Report detailing all completed tasks performed during a shift, and more. This session provides an overview of the app, and how it can be used to help VA health care teams. Learn more about how Product Effectiveness has worked with various stakeholders to collect user feedback about the Provider Program and VA Mobile apps, the results from the Product Effectiveness studies, and lessons learned for teams who are developing apps or deploying mobile devices. This session provides a behind the scenes look of how the teams work together and some of the results seen thus far. Learn more about Moving Forward, an app that helps users learn problem solving skills to overcome obstacles and deal with stress. Designed for Veterans and Servicemembers, but useful for anyone with stressful problems, it is especially helpful in managing challenges such as returning to civilian life, financial difficulties, relationship problems, coping with physical injuries, and more. The Moving Forward app and online course were developed by Department of Veterans Affairs (VA) and Department of Defense (DoD) and mental health subject matter experts across the country. Learn more about the self-certification program developed by the Human Factors Engineering office that will teach mobile app project team members how to conduct HFE compliance reviews. These reviews include a UI design certification and a heuristic evaluation, which will help optimize the usability and utility of mobile apps in development. This session provides an overview of the self-certification program, how to conduct HFE compliance reviews and how the program can help during the app development process. Learn more about Ask a Pharmacist, a new mobile app that consolidates VA resources to give Veterans easy access to trusted VA sources for information on VA medications and pharmacies. The app helps Veterans find their local pharmacy, learn about their medications—including how to identify their pills by sight—and more. Learn more about Patient Viewer, an app currently in field testing that makes it easier for VA care teams to find information quickly from patients’ Electronic Health Records (EHRs) from the convenience of a mobile device. The app helps care teams gain immediate access to EHR data— including labs, notes, medications and more— both in a VA facility and on the go. Introducing a new, mobile approach to scheduling VA appointments: the Veteran Appointment Request (VAR) App. Learn more about VAR, an app currently in field testing that makes it easier for Veterans to request primary care and mental health appointments at VA facilities where they receive care, view their appointment schedule, and even schedule certain primary care appointments directly through a calendar in the app. Designed to particularly help direct care providers including nurses, physical medicine and rehabilitation (PM&R) specialists and Imaging staff, the Safe Patient Handling App offers a blend of techniques and tools to prevent injury of both health care professionals and the patients they care for. This session provides an overview of the app’s tools and how it can be used to help both Veterans and care teams. Introducing a new, mobile approach to teledermatology: the VA TeleDerm App. The app provides a secure way to capture, store and view clinical digital images, complete consults and more, creating a streamlined process for providing teledermatology services quickly and effectively. This session provides an overview of VA TeleDerm, what kind of information it provides, and how to use it. Interested in new mobile tools for VA care teams? In Fall 2015, VA is field testing and preparing for a wider launch of Immunization Campaign - a new mobile app for care teams that helps providers and clinicians manage the administration of vaccines to multiple patients. The app also gives VA staff easy, mobile access to patient flu vaccine records and immunization history, including contraindications and or other precautions. This session covers an overview of the development of the Immunization Campaign App, and how it will help VA care teams care for patients and streamline their workflow during flu season. In 2014, VA launched the Airborne Hazards and Open Burn Pit Registry, an online questionnaire and voluntary registry that helps Veterans and Servicemembers learn about risks and health issues associated with airborne hazards—such as smoke from burn pits, oil-well fires or pollution during deployment—and about the health resources available to them through VA. This session provides an overview of the registry’s successes and lessons learned from the first year. Have you heard about 311VET? The convenient new app from VA gives Veterans a new way to get quick answers to their benefits related questions about pension, education, medical, disability, loans and more. This session provides an overview of 311VET, what kind of information it provides, and how to use it. Learn more about how these two apps can help VA and non-VA health care teams care for women Veterans. This session provides an overview of how these apps can be used by health care teams to incorporate preconception care into primary care visits, and treat the specific physical and mental health needs of women Veterans. Learn more about VA’s process of contracting for mobile app development, including what kind of apps VA develops, which elements of app development are contracted out, what VA is looking for in its mobile app contracts and how contracts are awarded. VA’s Mobile Health Provider Program gives VA care teams mobile technology to help them improve patient care. Learn more about the first year of the program, and what’s coming up in year two. MOVE!® Coach provides access to MOVE!®—VA’s successful weight management—from a mobile device. Learn how MOVE! Coach works, and how it can help Veterans meet their health goals. Learn how Imaging Viewing Solution integrates with VA’s Electronic Health Record to give VA care teams mobile access to diagnostic-grade medical imaging. Learn more about VA Mobile branding guidelines, why branding is important and how it fits in with the VA’s mobile development process. Learn what VA Mobile app business owners need to know to help guide an app through the complete development lifecycle. Learn more about how Annie, VA’s new mobile text messaging system, was developed, and how it can help Veterans track their health data. Learn more about the VA app development life cycle and the tools VA uses for project management and collaboration. Learn more about the tools and infrastructure required to develop a mobile app at VA with an in-depth look at the VA Mobile Framework used to help developers understand how VA Mobile apps are built. 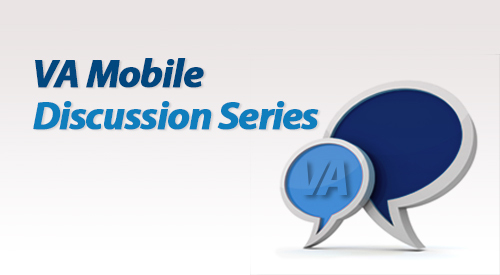 This inaugural session of the VA Mobile Discussion series, hosted by Shawn Hardenbrook, Director of the Connected Health Office’s Web and Mobile Solutions team, featured an overview of VA Apps currently in development.